In order for children to stay healthy and physically fit, it is important for them to be physically active. There are numerous activities children can participate in that offer an adequate amount of exercise and that are also very fun as well. One of these activities is bicycling. Bicycle riding is considered one of the best ways to reduce the risk of serious health issues that are acquired through a sedentary lifestyle. The are many health benefits associated with cycling. This particular activity greatly assists with children’s physical development. Bike riding provides the recommended 60 minutes of physical activity per day. Although cycling is one of the most moderate forms of exercise, it is a great cardiovascular workout to get their heart rate up and increase their stamina. In cycling, the arm, leg, and other muscle groups are constantly working. 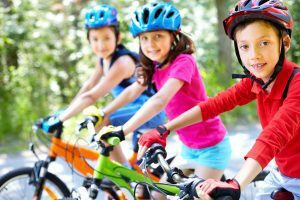 Bicycling helps with the emotional and mental development in children also. In fact, aerobic exercise in general has the ability to reduce anxiety and stress. Taking a peaceful bike ride can have an overall positive impact on a child and increase their self-esteem and self-confidence. Stimulates and increase balance, coordination and agility. These are all skills necessary to master bike riding. Fights obesity. 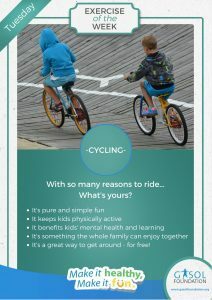 Cycling keeps kids active. 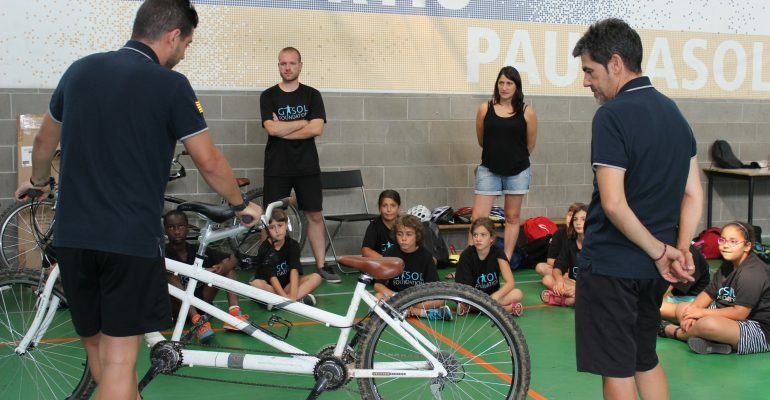 Being active, along with healthy eating and proper rest, is what Gasol Foundation promotes each and every day. Indeed biking can be a blast, but let’s not forget the safety measures and precautions that should be taken with it. A helmet, elbow pads and knee pads are must-have bike riding accessories. This is in case a child slides off the bike or falls onto the gravel. Protective gear will help them not get seriously injured. Safety first! As you can see, the benefits of biking are endless! And the best part…biking can be enjoyed by any age group. It is an inexpensive, fun and environmentally friendly activity for parents to do with their children. So parents, what do you say? Instead of taking the car, make biking with your child your main form of transportation. Half the wheels, twice the fun! National Nutrition Month – Go Further with Food!